The early reviews for Gangster Squad are in ... see the links below for the reviews. We've added the comments about Ryan below ... all attitude and eyelashes is our fave!! "the big selling-point is Ryan Gosling, who gets many of the best moments as the amusingly named Jerry Wooters. The romantic subplot between Gosling and Emma Stone (a good-time girl who’s wound up on Cohen’s arm) may seem a little bit like Crazy Stupid Love in fancy dress, but the pair’s chemistry still scorches, with writer Will Beall giving them some choice repartee"
"Sgt. Jerry Wooters (Ryan Gosling), whose womanizing skills come in handy to lure Cohen's current flame Grace Faraday (Emma Stone)"
"Jerry Wooters (Gosling, all attitude and eyelashes) seduces Cohen's No. 1 moll (Emma Stone)." 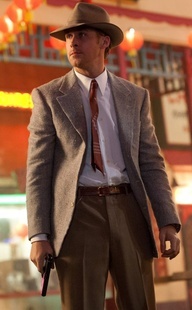 "Ryan Gosling (seen last year in Drive) plays O’Mara’s wise-cracking sidekick"
We know!! Ryan is keeping us busy right now ... but it is great to see all his work coming to the fruition!